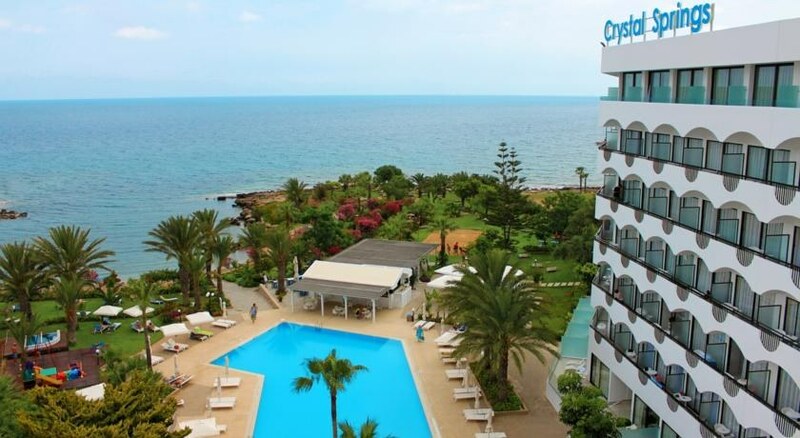 At Crystal Springs Beach Hotel, guests are treated to a luxury hotel with food, facilities and location all making for a memorable stay in Cyprus. Relax in one of the elegantly designed rooms with beautiful fixtures and furnishings. Try one of the exceptional restaurants that offer guests great dining experiences and food for all tastes from eating delicious authentic Greek whilst looking over the Mediterranean Sea to the poolside bar where you can relax with a drink under the Cyprus sunshine. 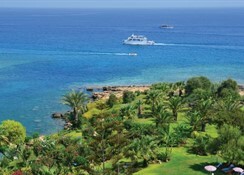 There is a comprehensive selection of activities on offer at Crystal Springs Beach Hotel. These include a tennis, scuba diving, snorkelling, beach volleyball as well as a daily activity programme catering to adults and children alike. Young guests will love the children’s pool and playground as well as family fun activities out in Protaras like the Ocean Aquarium and Magic Dancing Waters Live Show. 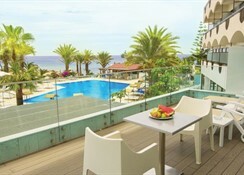 Crystal Springs Beach Hotel resides 68km from Larnaca International Hotel. Its beachfront location means that access to the beach is quick and easy. 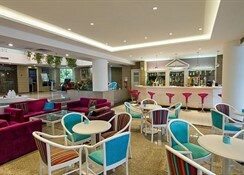 There are a wide variety of restaurants and bars around the hotel catering to many tastes. Family fun attractions such as the Ocean Aquarium is located less than a mile away whilst the amazing Magic Dancing Waters Live Show can be reached via a short car journey in 10-minutes. The main hub for retail and food shopping as well as conveniences such as cash points are to be found just a couple of miles away. Guests will be treated to beautiful rooms with incredible views. A delicate and carefully thought out arrangement of furnishings and decoration awaits guests who stay at Crystal Springs Beach Hotel. All rooms feature the basic amenities for a comfortable stay such as private balcony, wi-fi, T.V., room service and tea and coffee making facilities. Guests will also be welcomed to their room by finding sparkling wine, bottle of water and a fruit platter. There are several room types. Superior Rooms feature a double bed and sleep up to two people. 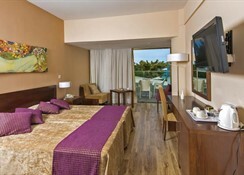 Superior Family Rooms are suitable for families of up to four people and are spacious and inviting. The luxury experience continues when you dine in at one of the hotel’s restaurants. Salamina restaurant offers an exceptional menu of international dishes and local delicacies. Basilikos serves sophisticated Mediterranean Meze all whilst overlooking the Meditteranean Sea. In addition, there is a poolside bar serving light meals and snacks as well as drinks and the Tefkros Bar, an indoor bar with an excellent selection of beverages. Around the hotel, there’s delicious fresh seafood to be had at Kalamies Beach Restaurant, authentic Greek food available at Sizzler’s Steak and Flambe House and an array of other global cuisines to be found. Local bars include Harvest Status Bar, Mexican Ranch Bar and Tipsy Turtle among many others. A great day relaxing and having fun at Crystal Springs Beach Hotel is easy to do with plenty on offer for guests. If you’re looking for a little adventure, then maybe you’ll want to try your hand at snorkelling or scuba diving available with a trained instructor. 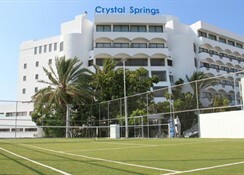 There are also tennis courts and beach volleyball also available onsite as well as a swimming pool for adults and a separate, shallower pool for children. A daily entertainment programme puts on a great selection of activities for all ages. The spa offers numerous ways to unwind including massage services, sauna or steam bath. Away from the hotel, hop in car and head to Magic Dancing Waters Live Show for an unforgettable night for all the family, Ocean Aquarium with its tropical gardens or simply laze about on the beach. Cancellations must be made 15 days prior to the date of arrival to avoid being charged. Cancellations made less than 72 hours prior to the date of arrival will be charged 100% of the booking fee. 68km from Larnaca International Hotel.